Yesterday, Roadtrip-'62 ™ traveled 111 miles: we’re beginning to put on some good distance each day now, which we’ll need to get all the way to the Pacific Ocean. We saw one of Pennsylvania’s premier natural attractions, the Grand Canyon of Pennsylvania, and traveled through the Allegheny National Forest. We also found some toy history at the home of Wooly Willy, and several pieces of railroad history. Today is our last full day in Pennsylvania because tomorrow we enter Ohio. We’ll stop at some more natural sites, learn some manufacturing history, and enjoy an amusement park. On the way, if you find anything you like, get yourself out on the road and enjoy it in person. This virtual roadtrip may be fun, but there's nothing like the real thing! While you’re here though, just click on an underlined word below to learn more about the places on the trip. Now, let’s get back on the road again! Before we leave Warren, let’s take a short walk through the Warren Historic District. This part of the city was placed on the National Register of Historic Places in 1999, though of course the buildings are much older. There are over 580 buildings, mostly in the Greek Revival and Italianate architectural styles. While we could have walked or driven past them in 1962, today the Warren County Historical Society offers a Self Guided Walking Tour Brochure to explain their significance. They also operate a museum in the former Irvine Elementary School, which was still a school in 1962. But the society’s museum was in the basement of the courthouse then, so we could have seen it anyway! We’ll head out of town on the old highway, which today is signed BUS US-6. At the west edge of Warren, we meet US-62, which joins us for the 5 miles to Irvine, Pennsylvania. Today we are on a freeway west from town, but as that wasn’t built until between 1969-1973, we would have stayed on a two-lane back in 1962. Route US-62 runs from the Canadian border at Niagara Falls, New York to the Mexican border at El Paso, Texas. We crossed it on our US-23 roadtrip at Columbus, Ohio. At Irvine, we’re almost out of the Allegheny National Forest, but there’s one more chance for a hike, at the Buckaloons Recreation Area. It’s not a very long trail and it only runs along the perimeter of the campgrounds, but it follows along both the Allegheny River and Irvine Run. Since I love to walk alongside water, let’s try it. And, since I didn’t stop for breakfast this morning, it’s also a pleasant place for a breakfast picnic. Just fire up that old Coleman camp stove and get some bacon sizzling! A timeless fair attraction, kids and their animals (photo used by permission of Warren County Fair). Also at Irvine is the Wilder Museum of Warren County History, operated by the Warren County Historical Society. The Historical Society has been around since at least 1955, though the museum may be newer. It houses a variety of exhibits including Native American artifacts spanning 8000 years, turn-of-the-century transportation and fashion, a gun collection, and furniture. Nearby Youngsville, Pennsylvania was once a furniture manufacturing town, with Forest Furniture occupying a factory along Brokenstraw Creek. Lumbering of hardwoods is still going on, which you can notice as we pass a modern sawmill west of Youngsville. Here, we lose the freeway and get back on the old two-lane for most of the next 65 miles. Pittsfield, Pennsylvania is next up and is home to the Warren County Fair. Warren County has held an agricultural fair since 1850, at various locations. It was in Youngsville from about 1935 until 1967, when the freeway we just got off of cut through the old fairgrounds. It was moved to Pittsfield, where you can find it from August 6-10, 2013. The fair is still a great agricultural showcase, with draft horse pulls, a milking parlor, sheep, lamb, rabbits, and even livestock auctions. 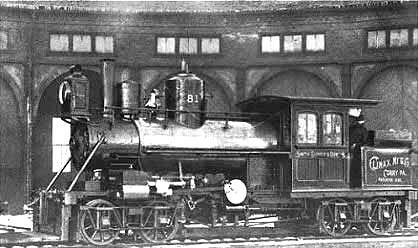 A Climax locomotive, with hometown ‘Corry’ painted on the tender (from Corry Pennsylvania Library archives). Corry, Pennsylvania is another town that had a bypass completed in 1967-68, but I’m driving into Corry on Washington Street, which used to be US-6. Corry is a small town that in some ways hasn’t changed much in over 140 years. The 1870 census showed 6,809 people: about 200 more than in the 2010 census. And in between, in1920, it was only 7228. Corry originally grew with America’s first oil boom in 1859. The boom began in the Titusville, Pennsylvania area, about 20 miles south, and included Corry because of the railroad junction, which made shipping oil cost effective. Probably as a result of the railroad activity and nearby logging, Climax steam locomotives were produced here between 1888 and 1928. There are still a few operating in the United States and on display abroad as far away as New Zealand. They were geared and especially useful for logging. The Corry Area Historical Society & Museum is located near the entrance to Mead Park and houses a wealth of historical information from the Corry area, including their famous Climax locomotive. Their engine was built in 1927 for the Barclay Chemical Company of Laquin, Pennsylvania. It was still in use as late as 1956, when like so many other coal-fired engines it was replaced by a diesel engine. A citizens’ group in Corry purchased it in 1960 and it has been in Mead Park since, so we could have seen in back in 1962. Mead Park itself is one of Corry's gems, with numerous recreational opportunities. This 50 acre park has a Civil War monument, erected in 1901, even though few men from the area served in that war. Though the locomotive factory is long gone, Corry has at least one industry that has been around a long time. Corry Manufacturing has been developing and manufacturing aircraft and gas turbine components since 1945. If you’re a golfer, the town is also home to Corry Country Club, an 18-hole course founded in 1922. I’m not a golfer, so I’m heading out to the Corry Fish Culture Station. This fish hatchery was originally constructed in 1876 and today stocks many nearby streams with four species of trout. The outdoor linear raceways are covered for shade and are right off the highway, making them an almost irresistible stop. There is also a small indoor exhibit. There is another fish hatchery at nearby Union City, Pennsylvania: they must need a lot of fish around here! You’ve undoubtedly noticed that the countryside has been flattening out the last day or two. We’ve left Pennsylvania’s Endless Mountains behind and US-6 won’t hit another mountain area until Colorado! By the end of today, we cross into the Great Lakes watershed and the terrain will stay virtually flat for many days, until we leave the Chicago area. The area between Lake Erie and Lake Michigan was ground flat by glaciers several times ending about 14,000 years ago and nothing has changed much since. Flat land means more farms, and we’re also seeing that already. Moving on to Mill Village, Pennsylvania, we meet another US-numbered route, US-19. It joins us and runs with us to Meadville, Pennsylvania. We first saw US-19 on Roadtrip-’62 ™ way down south in Johnson City, Tennessee, on our US-23 journey. The highway goes from Erie, Pennsylvania to Memphis, Florida, crossing the Sunshine Skyway Bridge over Tampa Bay near its south end. At Mill Village, we also come to the most unusual junction on US-6. Here, the route splits in two, with US-6N running just 28 miles to West Springfield, Pennsylvania, near the shores of Lake Erie. US-6N was the original route of US-6 when it was first signed in 1926. It was extended westward beginning in 1931 and that’s the route we will continue down to Long Beach, California. But since the round trip on this spur is only 56 miles, I think we have time to go out and back and see some of the sights along US-6N. Edinboro, Pennsylvania is both a resort town and host to a small college. Edinboro University was founded in 1857. It’s a liberal arts college with an undergraduate program covering specialties in cinema, graphic design, photography, ceramics, jewelry/metalsmithing, two-dimensional arts, sculpture, textiles, and wood/furniture design. As to the resort aspect, you anglers will want to check out Edinboro Lake. The lake is impounded behind a dam and the State of Pennsylvania stocks it with muskellunge and walleye. Probably from the fish hatcheries we just passed. In addition, you can catch both largemouth and smallmouth bass. If you want to stay to fish, you might check the Edinboro Hotel Bar for lunch. The hotel has been here since the turn of the 20th century, so we could have stopped in 1962. Video of the Albion, Pennsylvania Historic Carousel from WJET-TV in 2001. Albion, Pennsylvania's Historic Carousel is the second oldest working carousel in the United States. Though its original location is unknown, it operated at Creek Valley Park of Wellington, Ohio from 1940 to 1946. In 1947, it was purchased and moved to Albion, where it has been since. One chariot was built in 1991 but the others are originals. This carousel was built by the U.S. Merry Go Round Company in 1890. An unusual feature is that it was originally horse drawn. One reason it is still in such good condition is that it’s stored in an enclosed building except when used during the Albion Area Fair. The Fair is held in mid-September, so come then if you want to ride the carousel. Albion is also home to the Rogers Brothers Corporation, which builds large truck trailers. They’ve been here since 1905 and have a place in history as the builder of the trailer to haul "Jumbo," an early atomic bomb tested in New Mexico during World War II. US-6N ends at highway US-20 in West Springfield. Route US-20 is the longest US-numbered route, currently traveling 3,365 miles from Boston, Massachusetts to Newport, Oregon. Before California shortened our US-6, US-20 was only the second longest route. Mildly interesting that the longest and second longest routes connect via this US-6N spur, which was the original US-6. But in my opinion, the most interesting place on US-20 is Yellowstone National Park, which is enough to make it the subject of a Roadtrip-’62TM trip someday. This sidetrip up US-6N ends in an area of Lake Erie that has some spectacular steep bluffs above the Lake Erie beach, which have only recently been protected as public parks. The David M. Roderick Wildlife Reserve is on property formerly owned by United States Steel Corporation, which had intended to build a steel mill on the site. Fortunately for nature lovers, those plans were changed in the 1960s and they later sold the land. If you come this way, you might end your trip down the original US-6 at the Sunset Motel, which looks like a remodeled older motel. The current owners have been upgrading things since 2005 and it looks pretty good. Then head down to a beach and enjoy a swim and the sunset! I’m turning around though, as the wildlife reserve was not here in 1962. I’m making a stop at Cherry Hill, Pennsylvania, which we passed through just 3 miles back. Cherry Hill Drive In Ice Cream has been serving tasty treats since 1959 and is just the spot for a snack to hold me over until lunch. Back on the main US-6 route after checking out the diversion, we next come to Cambridge Springs, Pennsylvania. Part of US-6 is signed as Washington’s Trail through Crawford County, commemorating George Washington’s journey to French forts in the area during the winter of 1753-1754. The county is named for Colonel William Crawford, a soldier, surveyor, farmer and life-long friend of President George Washington. Cambridge Springs grew famous in the period from 1884 to the early 1930s due to mineral water springs in the area. More than 40 hotels, springs houses, and rooming houses were built and the mineral water was offered both on site and to go by several bottling works. In 1935, the giant Rider Hotel burned to the ground and that left the Riverside Inn, built in 1885, as the lone survivor of a glorious bygone era. The Rider Hotel has been listed in the National Register of Historic Places since 1978. Cambridge Springs was conveniently located on the Erie Railroad line exactly halfway between New York and Chicago and there is a monument noting this near the depot. With this favorable location and mineral springs as an attraction, in the early 1900s eight trains per day brought guests to the resorts. There isn’t much else to see here and wasn’t back in 1962 either. There was a small college back then but it closed in 1987 and the buildings now house a correctional facility for women. Cambridge Springs Area Historical Museum is in the former City Hall building and preserves some of the history of the years of the mineral water boom. What’s of interest to me is the Erie National Wildlife Refuge, just southeast of town. The refuge was established in 1959 and now has over 2,500 acres under management. We saw several other refuges along our US-23 journey, including Shiawassee in Michigan and Okefenokee in Georgia. Like other national refuges, the purpose at Erie is to provide waterfowl and other migratory birds with habitat, to support other wildlife species, and to provide opportunities for wildlife-oriented public recreation. This refuge includes marshes, swamps, man-made ponds, creeks, wet meadows, and my favorite: beaver floodings. It’s always hard to spot beavers, but let’s take a hike and see if we get lucky today. The obvious choice is Beaver Run Trail, which is a one mile loop around a beaver pond with a short spur trail at one end. If you’d like to try some of the local spring water, it’s still available. Saegertown Beverages of Saegertown, Pennsylvania has been putting it in bottles since 1919. Today it is sold under the Eureka Springs brand and many other private labels. Back in 1919, and still in 1962, you could buy the water as the main ingredient of Saegertown Ginger Ale and other flavors of soda. That hike worked up an appetite, so the first thing I’m going to do in Meadville, Pennsylvania is to have lunch. Eddie’s Footlong Hot Dogs has been in business since 1947 and at the current location since about 1960, so it’s perfect for us. Footlong hot dogs were a treat when I was a kid. I remember my dad buying them for home cooking occasionally. And if we were really lucky on a Sunday drive, he would buy them at an A&W. He was fond of them with coney sauce. Of course, you can get them with sauce at Eddie’s, along with a variety of other toppings. I like them as a chili cheese dog. Like many of these small eateries, the hot dogs are made locally, which makes the menu special. Eddie’s uses a local favorite from Smith Provision of nearby Erie, Pennsylvania. Smith Provision has been making sausages and other meats since 1927; I’m sure we could have bought some here in 1962. Also like many of these places, it’s closed in the winter, so get here in the summer! Before 1974, US-6 and US-19 would have continued straight south into town on Baldwin Street and come out the other end on Park Avenue. That’s what we will do, though US-6 now bypasses town on a divided highway. Also at Meadville, US-322 joins and runs west with us to Conneaut Lake, Pennsylvania. This route starts in Cleveland, Ohio, where we will run into it again tomorrow. The other end is in Atlantic City, New Jersey. Meadville has one of the most picturesque parks I’ve ever seen, Diamond Park, just off the downtown. It’s ringed by impressive buildings such as First Baptist Church and beautiful old residences. The park is also home to a wonderful collection of monuments, statues, Shippen Fountain, and a gazebo. Shippen Fountain is the gift of Evans W. Shippen, who owned iron foundries near Philadelphia. He moved here, joining his brothers in the emerging oil industry. It was the placement of the fountain that bears his name that inspired every other monument and memorial in Diamond Park. The park had been nothing more than a barren ground used for grazing animals, but became a local showplace. The fountain is believed to be the second oldest iron fountain in the country. It has been damaged by the rust of over a century, with some parts missing. The Civil War monument is another of the more impressive monuments in the park. Just off Diamond Park is the small Johnson-Shaw Stereoscopic Museum. This museum showcases an early method of viewing 3D pictures, the stereoscope. It’s located in Meadville as a tribute to the Keystone View Company, founded in 1892 and which was the largest US producer of stereoscopic views and equipment. The business evolved into manufacturing other optical equipment and was moved out of town in 1976. While the museum wasn’t here in 1962, it’s a good place to be reminded of how the old static stereoscopes eventually morphed into the revolving pictures of the Viewmaster. Of course we had a Viewmaster in 1962, didn’t everyone? They were a great way to take a roadtrip without leaving the house, viewing pictures of the Grand Canyon and foreign countries. My grandmother had one also, and it kept four kids busy when we visited, while the grownups were talking. Strangely, she also had a stereoscope and some cards from when she was younger. She later gave those to me and I still have them, though I don’t have a Viewmaster any more…go figure. Keystone View Company is long gone, but Meadville is still home to Channellock! Since 1886 they have been manufacturers of tools, including the famous Channellock pliers. This distinctive tool was patented and trademarked in 1935, so we would have been using them back in our favorite year. There have been more innovations and patents over the years, so that a true Channellock plier is different from generic locking pliers. Not only are the tools still made in the US, but even the steel is North American made. But they’ve come a long way from a blacksmith hand-forging tools over charcoal. Today, the forge is computer controlled, the heat is supplied by microwaves, and the pliers’ jaws are laser hardened! The tools are still hand finished, grinding and polishing them to perfection. The modern zipper fastener was also invented here in Meadville, by Gideon Sundbäck, chief designer for Universal Fastener Company. He came up with a useable design for the company in 1913. The company later changed its name to The Talon Corporation and was headquartered here. Talon dominated the zipper market in the 1960s, so chances were good that your clothes used them back then. They suffered financial problems after being sold to another company in 1978 and not only ceased production here, but now account for only about 7% of the worldwide zipper market. There are no facilities left in Meadville. Before we leave this historic town, we should stop at the Meadville Market House. This market was built in 1870 and still offers jewelry, crafts, homemade candies and pastas, fresh produce and homemade baked goods. It’s Pennsylvania's oldest market house in continual use. We should pick up a little produce and maybe some donuts for our next picnic. And finally, though it was not a museum back in 1962, a drive-by of the beautiful Baldwin-Reynolds House is in order. This antebellum-style home was built in 1843 and was home to a US Supreme Court Justice. Henry Baldwin was one of the few US Representatives who defended President Andrew Jackson's invasion of Florida during the First Seminole War in 1818. Baldwin became a major player in Jackson's winning the 1828 presidential election in Pennsylvania. President Jackson then appointed Henry Baldwin to the Supreme Court in 1829, apparently in appreciation. Confirmed in two days (Can you imagine something like that today? ), Baldwin remained on the bench until his death in 1844. He had the house built only two years earlier and barely had the opportunity to enjoy it. The house became the first house in Meadville to receive natural gas lighting because the next resident, William Reynolds, was president of the Meadville Gas and Water Company. The reason we could not have seen it as a museum back in 1962 is that Katherine Reynolds lived in the house until her death in 1963. It was then willed into a public sale and the Crawford County Historical Society purchased the property. They not only have kept it as a museum, but have obtained many of the Baldwin and Reynolds families’ furnishings to display. Heading west through the outskirts of Meadville, we pass a fantastic set of sculptures at the PennDOT maintenance yard site! This project was begun in 2002, so we couldn’t have seen it in 1962, but don’t miss it today. All the sculptures are made from used highway signs, some cut and other used whole. There is about a quarter mile on the fenceline along US-6, plus a flower garden in front of the building. The project is titled “Read Between The Signs” and more than 900 community members have provided design ideas. It’s coordinated by the local Allegheny College, using a team of college and community interns. Scenes in the fenceline mural include a farm, hot air balloons, a snowman, road maintenance crews, the Baldwin-Reynolds House, and more. And, it’s reflective at night! The next six miles are on a divided highway, which has been here since 1961 because of heavy traffic. The traffic was heavy back then because our next stop is an amusement park in Conneaut Lake, Pennsylvania. The place is Conneaut Lake Park, home of a real wooden roller coaster: The Blue Streak. It’s still running and the miniature golf course renovations are complete. I’ll try both! The Blue Streak was constructed in 1937, has a beginning hill of seventy-seven feet with a sixty-nine foot drop following. 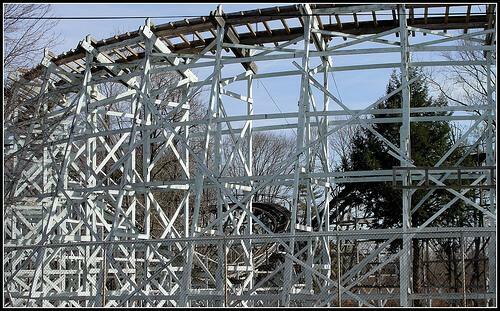 Many people like a roller coaster for the size of the drop, but I like the ones that throw you around on the curves, which is usually the style of these old wooden coasters. There are also lots of rides for the little ones in Kiddeland, including the Little Dipper, pony rides, Tubs of Fun, Jolly Catapillar, and of course, a Tilt-A-Whirl. There’s also a public beach within the park. Conneaut Lake is Pennsylvania's largest natural lake and was formed by the retreat of glaciers. We’re completely out of the mountains now and will be in glacial plains for several days. The lake has no boat horsepower restrictions, making it great for water-skiing because you can go as fast as you dare. The area has been used as a resort since the 1870s, when Aaron Lynce established a boat launch and picnic area on the site of Conneaut Lake Park. 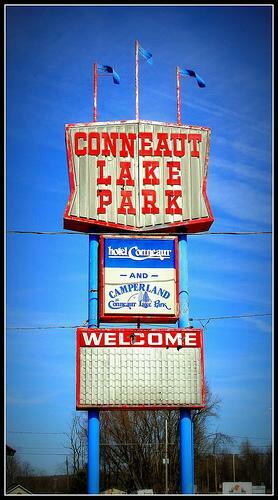 Conneaut Lake Park is unusual among amusement parks because it is a charitable Public Trust. As such, it relies heavily on volunteers and donations, in addition to ticket fees. It’s always FREE to walk into the park: you only pay for the rides, food, gifts, etc. Opened in 1892 as Exposition Park, this gem of a park survives as a kind of trip back in time. It’s probably as close to a 1962 amusement park as we will find; without the modern theme areas, giant steel roller coasters, and other thrill rides. It is not yet on the National Register of Historic Places, but they have been ruled eligible. Unfortunately, they may have waited too long. Years of mismanagement created a debt situation with back taxes that the current board inherited in 2007. The trust is working with the County and legal counsel to address the issues and avoid a sale of the property. A sale might be a disaster, so come NOW, in 2013! The Hotel Conneaut on the property was constructed in 1903 and was one of over a dozen in this resort area. What we see today is only a portion of the original, as a lightening-caused fire resulted in destruction of most of the building in 1943. It’s worth noting that the Hotel Conneaut tries to maintain a balance between history and modern convenience. In the past, rooms were not equipped with heating, air conditioning, telephones, or television. Most rooms are now, but they maintain a few without such modern amenities. All rooms do have a private bath, but the hotel looks and feels old and may not be to everyone’s taste. I think I’ll enjoy dinner at Elizabeth's Dining Room here in the hotel. If you would rather try some more ice cream, the nearby Hanks Frozen Custard has been open since 1952. And of course, there’s always carnival style food in the park…such difficult decisions! Popular singer of the late 1950s era, Perry Como, was originally a barber and used to cut hair in the Hotel Conneaut barber shop during the day and perform at the Dreamland Ballroom during the evenings. Perry’s “Once Upon a Time” of 1962 is from a Broadway musical of that year, “All American”, written in part by Mel Brooks. For now, you can still sit on the wooden rocking chairs at the hotel and watch a summer moon rise over the lake. I think I’ll stay the night and wait for a moonrise. See you tomorrow when Roadtrip-’62 ™ heads into a new state.